In 1996, The Peregrine Fund reintroduced California condors to northern Arizona. 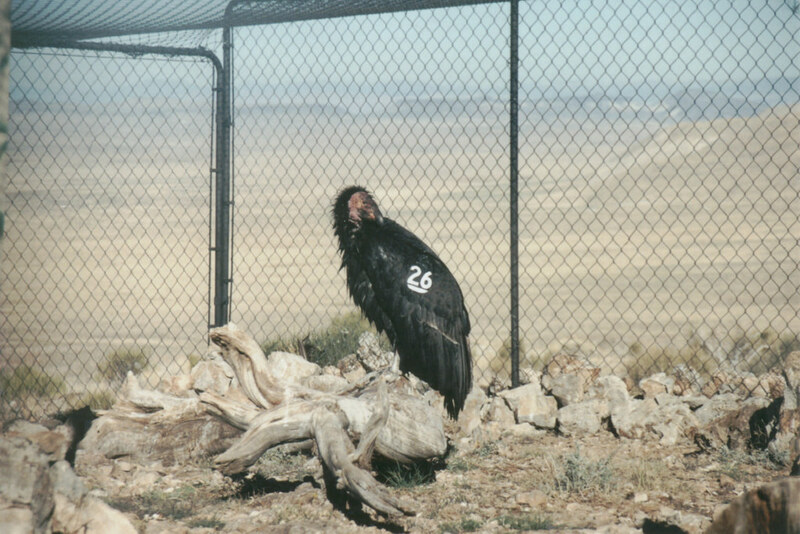 Once down to a mere 22 captives, there are now nearly 200 condors flying free in the southwestern US. 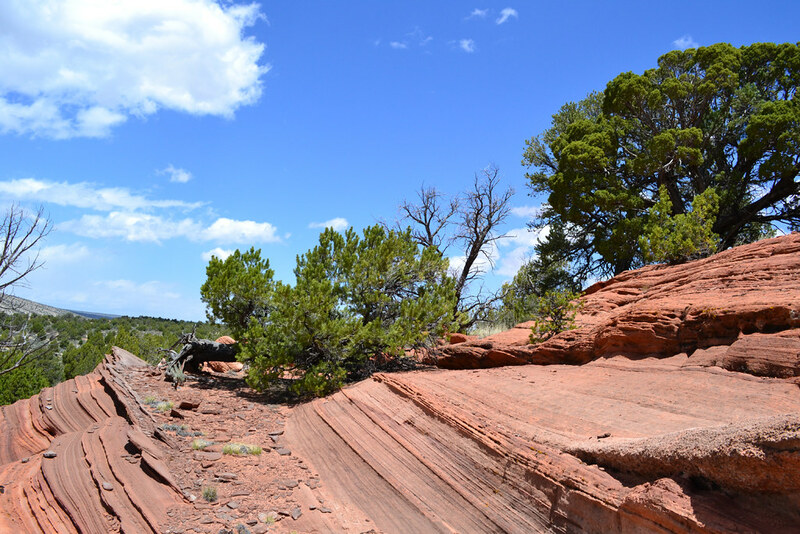 We visited northern Arizona in hopes of finding snakes beneath soaring condors. 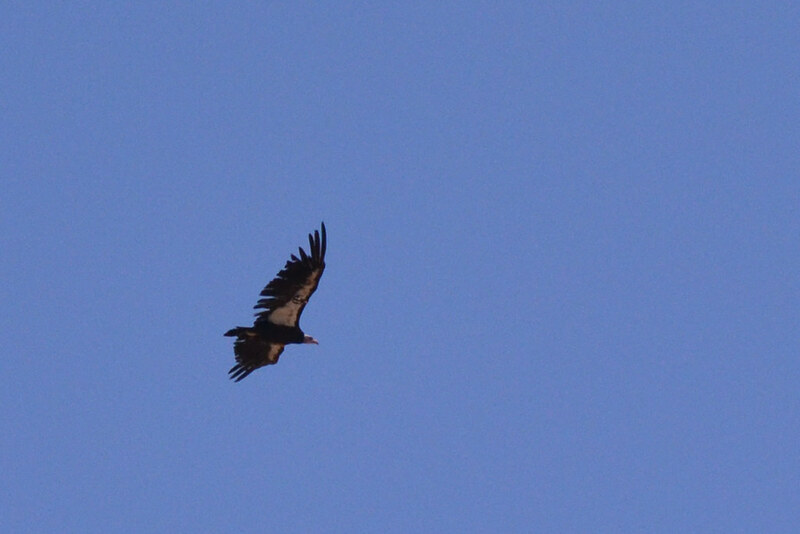 We learned of a trio of condors (2 males and a female) raising a chick in a cave overlooking House Rock Valley. Like Arizona black rattlesnakes, condors are social: they forage and roost in groups in which immature birds learn from experienced adults how to find food and appropriate resting sites. So it is perhaps not so unusual for a nest to have an “extra” adult male helper. We attempted to see this trio of nesting condors, but the wind howled so fiercely that we were barely able to fix a binoculared gaze on the cliffs above us. Besides, would an animal choose to be out in such unpleasant conditions? We thought not, and decided to find a place to explore that would shelter us from the wind. The valley bottom, with stands of juniper and islands of protruding sandstone, looked to be such a place. We followed a dirt road and arbitrarily selected a place to park. We threw on our packs and crossed the road, noticing a long, dark form on the road we’d just driven. We approached to find a gophersnake (let’s call him Bluto) whose chocolate ladder of blotches contrasted beautifully against a pale yellow background color. Surely realizing his vulnerability, Bluto headed directly to a juniper at the road’s edge. By the time we drew our cameras, he had found a burrow and disappeared into it. 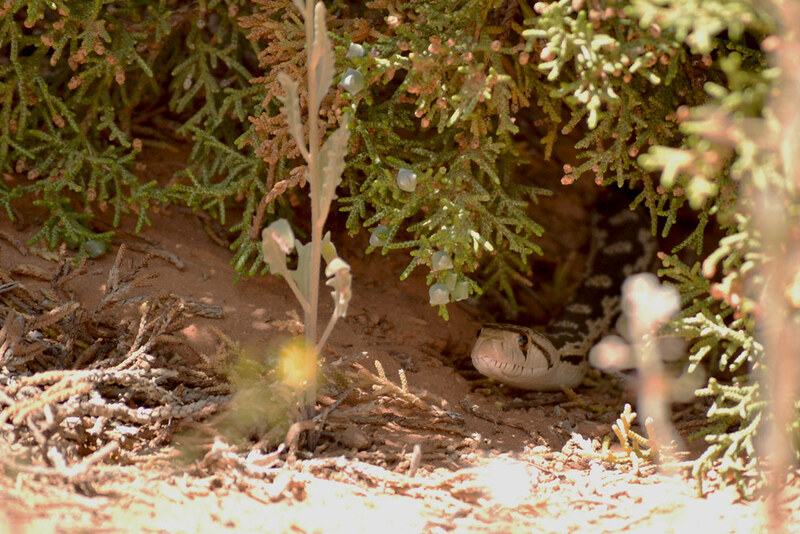 Our lamentations of his escape were short-lived, because in an adjacent sagebrush lay not one but TWO gophersnakes. Given the season and the apparent amorous nature of their entanglement, we surmised they were a male and female pair (let’s call them Popeye and Olive Oyl). Olive Oyl maintains a wary eye while Popeye’s attentions are consumed by his potential partner. Bluto, the largest of the trio, assessing threats topside. 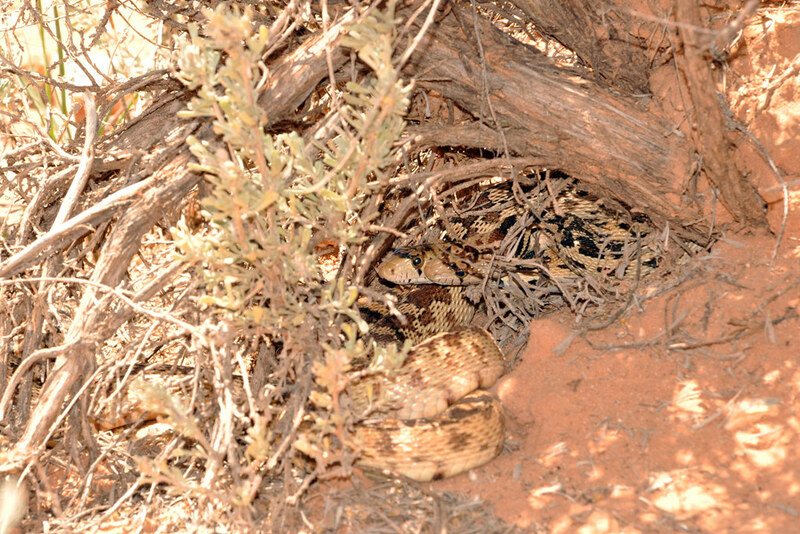 Rather than try our patience against reptiles, we decide to explore the area for a while and come back later. 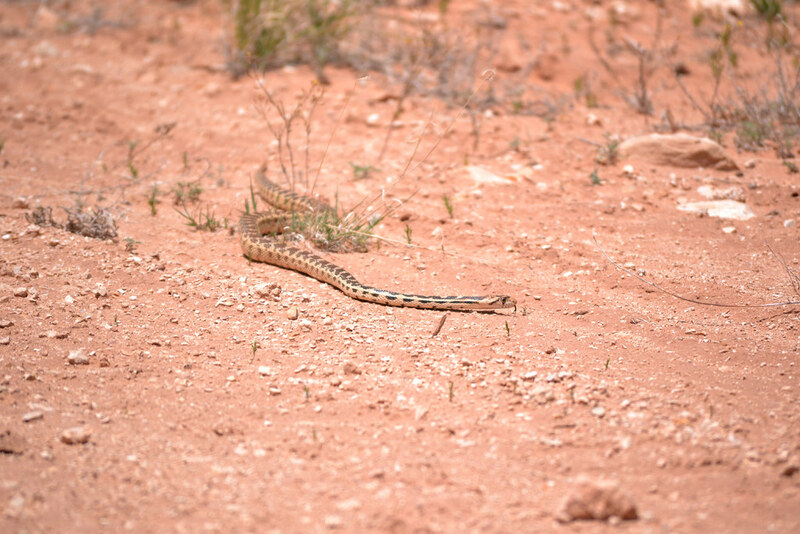 After about an hour we make our way back to the gophersnakes. As we walk down the road toward the spot, we see Olive Oyl meandering through the roadside vegetation, about 10 m from where we initially found her. She turned as if to cross the road, but paused before entering the barren dirt roadway. After a couple of minutes, Popeye came cruising through the same grass she’d just passed. We watched him make several wide loops, even coming within a couple meters of her before turning away. Meanwhile, after remaining motionless for several minutes, Olive Oyl turns and moves slowly from the road. Popeye finally comes upon Olive Oyl, grasping her with his mouth behind her head (see video at 0:41). Feeling vulnerable, perhaps because of our presence, Olive Oyl is able to slowly worm to what cover is afforded by a small shrub. Bluto enters the stage from the same area as the other two, vaguely following the same path. We watch as he loops and circles, at times retracing his path backwards. He approaches the pair within a couple meters several times, and even passes by our feet, which gives him only momentary pause. Finally, his search is over. Bluto immediately begins biting Popeye. Finally, Popeye is induced to release his grasp of Olive Oyl. Without delay she flees and we lose track of her. Although Popeye flinches and squirms with apparent discomfort from the biting he receives, he does not appear to retaliate in kind. He escapes the assault by disappearing into a burrow in the lower left quadrant of the frame. Once Bluto realizes his rival has fled, he turns his attention to Olive Oyl, following the exact path she used to escape the dispute.